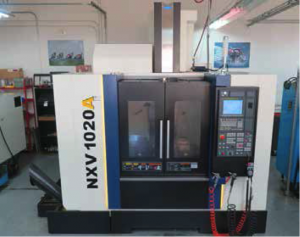 2014 YCM NXV1020A CNC Vertical Machining Center s/n 0443 w/ Fanuc MXP-200FA Controls, 25-Station Side Mounted ATC, BT-40 Taper Spindle, Hand Wheel, Thru Spindle Coolant, Rigid Tapping, Chip Augers, Chip Blaster D30-35 High Pressure Coolant and Filtration System, 2052 Hours, 20 ½” x 44” Table. 1999 Supermax MAX-3 Rebel CNC Vertical Machining Center s/n 902917 w/ Fanuc Series 0-M Controls, 20-Station ATC, BT-40 Taper Spindle, 8000 RPM, Hand Wheel, Rigid Tapping, Habor Cooler, 15 ½” x 37” Table, Coolant. 1998 Supermax MAX-1 Rebel CNC Vertical Machining Center s/n 711760 w/ Fanuc Series 0-M Controls, 20-Station ATC, BT-40 Taper Spindle, 8000 RPM, Hand Wheel, Rigid Tapping, 16 ½” x 33” Table, Coolant. 1995 Supermax MAX-1 Rebel CNC Vertical Machining Center s/n 511260 w/ Fanuc Series 0-M Controls, 16-Station ATC, BT-40 Taper Spindle, 8000 RPM, Hand Wheel, Rigid Tapping, 16 ½” x 33” Table, Coolant. 1994 Supermax MAX-1 Rebel CNC Vertical Machining Center s/n 4081088 w/ Fanuc Series 0-M Controls, 16-Station ATC, BT-40 Taper Spindle, 8000 RPM, Hand Wheel, 16 ½” x 33 ¼” Table, Coolant. Tree Journeyman 250 mdl. J-250- CNC CNC Vertical Mill s/n 4-35- 33-1164 w/ Tree PC-2100 Controls w/Hand-Held Teach Pendant Control, 40-Taper Spindle, Chrome Box Ways, 10” x 39” Table. Supermax YCM-TC- 15 CNC Turning Center s/n 701386 w/ Fanuc Series 0-T Controls, 12-Station Turret, Hydraulic Tailstock, 7” 3-Jaw Power Chuck, Coolant. Promax mdl. YC-11/2VS- 42 Vertical Mill s/n F981326 w/ Sony Millman DRO, 3Hp Motor, 60-4200 Dial Change RPM, R8 Spindle, Chrome Ways, Power Feed, 9” x 42” Table. Hardinge mdl. HC Hand Chucker s/n HC-5056- T w/ Threading Attachment, 125-3000 RPM, 8-Station Turret, 5C Collet Closer, Power Feeds, Trava-Dial, Coolant. Import mdl. RF-916B 9” Horizontal Band Saw s/n 091120 w/ 4-Speeds, Manual Clamping, Work Stop, Coolant. Powermatic mdl. 143 14” Vertical Band Saw s/n 7843442. Abrasive Finishing Co “Super Quiet Burr Bench” Media Tumbler w/ 16” x 20” Tub. Belaire mdl. 5312H 10Hp Horizontal Air Compressor w/ 120 Gallon Tank, Donaldson Refrigerated Air Dryer. Cantilever Material Rack w/ Aluminum Round, Square, Rectangular Bar Stock. Haas 4 th Axis 5C Rotary Head w/ Servo Controller. (8) Kurt 6” Double-Lock Vises. (14) Kurt and Eron 6” Angle-Lock Vises. (5) Huot Toolscoot 40-Taper Tooling Carts. Kennedy 15-Drawer, 8-Drawer and 7-Drawer Roll-A- Way Tool Boxes. Snap-On 7-Drawer Roll-A- Way Tool Box. Insert Turning, Boring and Milling Tooling w/ Carbide Inserts. Starrett HB-350 14” Optical Comparator s/n 20100 w/ Quadra-Chek 2000 Programmable DRO, Digital Angular Readout, Shadow Detector, Surface and Profile Illumination, Parts Fixture. (2) Mitutoyo 6”-12”, 0-6” and 0-3” OD Mic Sets. (2) Etalon 0-1” Indicating OD Mics. (2) Mitutoyo 0-1” Digital OD Mics. Mitutoyo 2”-3”, 1”-2” and 0-1” Thread Pitch Mics. Etalon Bore Mics 1.8”-2.0”, 1.6”-1.8”. Mitutoyo Bore Mic Set .275”-.500”. Mitutoyo Dial Bore Gage 1.975”-3.075”. Mitutoyo .44”-.72” Dial Bore Gage. Mitutoyo 1”-2” and 0-1” Anvil Mics. (3) Mitutoyo 0-3” and 0-6” Depth Mics. Mitutoyo 12” and 6” Digital Calipers. (3) Etalon 6” Dial Calipers. Meyer Pin Gage Cabinets 0.011” -1.000”. Meyer Pin Gage Sets .251”-.500”, .061”- .250”, .011”-.060”. Deltronic Gage Pin Sets and Misc Gage Pins. Dial Test and Dial Drop Indicators. Starrett 24” x 36” x 6 ¼” Crystal Pink Grade “A” Granite Surface Plate w/ Roll Stand. 1999 Ducati 996 Motorcycle Lics# 15B2459 w/ Ohlins Advanced Suspension Technology Front and Rear, Magnesium Wheels, Carbon Fiber Body Work, Carbon Fiber Exhaust, 10,440 Miles, Never Ridden in Rain or Snow, Annual Maintenance Kept Up.